If you’ve read my previous article on Expected Wins 4 (Is European Football Really Higher Quality than Major League Soccer) you’ll know that there are teams out there who can, and do win, ‘without’ exceeding 50% possession. In my next evolution of analysis, using the Family of Possession with Purpose Indicators on Major League Soccer, here’s some more granularity to go with that observation. Teams whose volume of Pass Attempts, into the Opponents Defending Final Third, fall below the League Average (117.54). To highlight what teams, and what volume of games those teams won, where ‘CONTROL’ of the game would most likely be interpretted as ‘minimized’ given a poorer ‘team performance’. In addition, I also sense it may be a good way to differentiate between teams who use a Counter-Attacking “tactic” as part of their Possession-based game versus a team more inclined to play a Direct Attacking style/system. The really hard part here is I’m not using video and I don’t have access to X,Y coordinate data – this is all put together using public data. However viewed I hope you find this interpretation beneficial. There were 234 games last year where a team won in MLS. Of those 234 games, 122 of them the winning team had lower than 50% Possession. In other words, 52.14% of all games won last year saw the winning team possess the ball less than 50% of the time. Of those 234 games, 70 of them the winning team had less than 50% Possession and less than 77% Passing Accuracy. In other words, only 29.92% of all games won last year had the winning team performance fall below League average in Possession and Passing Accuracy. Of those 234 games, 53 of them the winning team had less than 50% Possession, less than 77% Passing Accuracy (across the entire pitch) and less than 66.8% Passing Accuracy in the Opponent’s Defending Final Third. In other words, only 22.65% of all games won last year had the winning team performance fall below League average in Possession and Passing Accuracy (both within and outside the Opponents Defending Final Third). By the way, for those curious, in only 19.66% of all games lost this year (234) did the losing team EXCEED the League Average in Possession and Passing Accuracy (both within and outside the Opponent’s Defending Final Third). 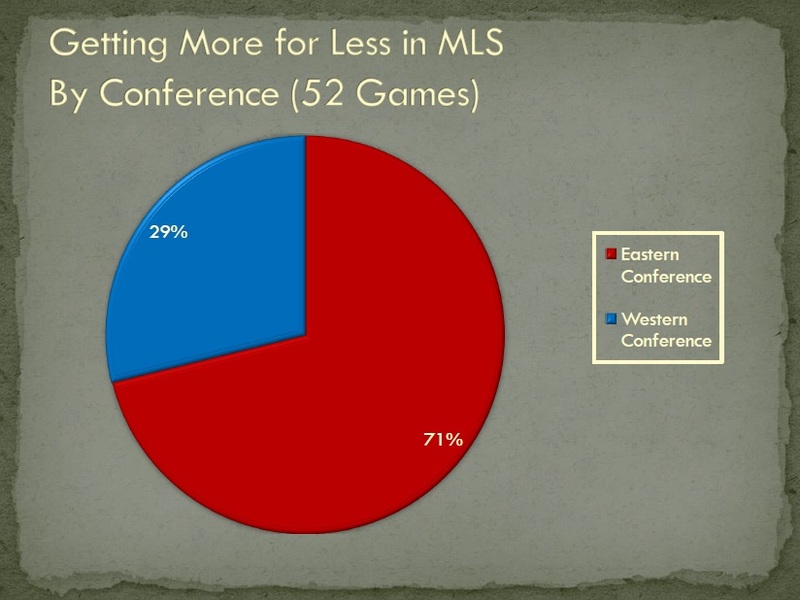 The Red Bars signify Eastern Conference Teams while the Blue Bars show Western Conference Teams (last year). For now it should be noted that DC United took 24 of 59 Points where they performed far below league average in passing. In addition, New England also took 21 of their 55 Points in games where they performed far below league average – and six of those seven wins came after Game 25 – in other words after they signed Jermaine Jones! With respect to Philadelphia – five of their six wins, using this filter, came after Jim Curtin replaced John Hackworth. They had an injury or two that impacted this style of play and, under Nelsen, were unable to recover from a key attacker being missed. Of note – Chicago recently brought in two DP Strikers – is that a signal to the rest of MLS that Frank Yallop really intends to go all out in this type of attacking approach? Finally, FC Dallas appeared to be the more counter-attacking/direct attacking team in the Western Conference – and this data appears to substantiate that. Oscar Pareja’s approach was good enough to make the Playoffs last year – but with Houston (under Owen Coyle) and Sporting, another possession-based team, set to join the Western Conference, might we expect to see Pareja take a different approach next year? A marked difference in volume of teams that got more with less in the Eastern Conference. Well, for me, over the past few years I’ve found it pretty hard to differentiate between a team that works towards Direct Attacking, as a style, as opposed to Counter-Attacking. And to be honest I’m not sure what the difference is; at least up until now. Here’s my draft definition on how to define a team that Counter Attacks (as a tactic) as opposed to using Direct Attacking (as ‘the’ tactical system/style/approach). The league average for passes attempted across the entire pitch is 428.01. So for the purposes of this effort all teams that fall below that average will be viewed as Counter-Attacking teams until I see that their volume of passes attempted in the Opponent’s Defending Final Third also falls below that League average of 117.54. My rationale is this – a consistent trend of low volume in passes attempted both within and outside the final third indicates to me that the team is attempting to play longer or quicker balls into the final third – that have less chance of being completed – in other words looking to penetrate with less overall control of the ball. Only one game did the volume of Pass Attempts exceed the League Average of 428. In that one game the volume of Pass Attempts within the Opponents Defending Final Third did not exceed the League Average. DC United had that game. Only 11 games saw the volume of Pass Attempts in the Opponents Defending Final Third exceed the League Average of 117. New England had five of those games, Seattle had one, DC United one, Vancouver one, and Philadelphia three. Therefore in 40 of the 52 games played, using this filter, it would appear that the team that won played Direct Attacking Football. Meaning the teams that performed best in Direct Attacking football were DC United (7), Toronto (5 under Nelsen), Dallas (5), and Chicago (3). Gut-Check on my Direct Attacking hypothesis – a pretty well known/attributed Direct Attacking team in the English Premier League is West Ham. Of their 19 games this year every single game saw their total Pass Attempts fall below the League Average of 426.73. In 11 of those games their Pass Attempts, within the Opponents Final Third, fell below the League Average of 131.82. They won seven of those 11 games. In conclusion, the gut-check pans out – it appears that the outputs from West Ham match those developed based upon what is seen in MLS. The data also confirms that Sam Allardyce, and his Hammers, are doing a pretty good job of executing that system as well. 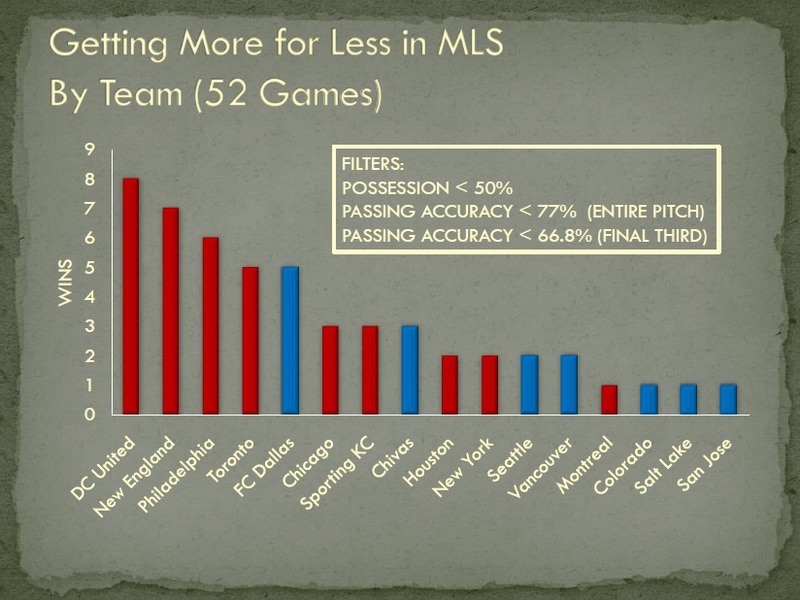 Doing more with less had a significant advantage for DC United, New England, Philadelphia, and Toronto – all those teams, tops in this filter, are in the Eastern Conference. This information also supports the views, by many, that the two Conferences are different; the Eastern Conference has more teams that were successful in doing ‘more with less’ and more teams, who were more successful, in their Direct Attacking style/system. It seems reasonable to me that this is a way for me to better quantify the difference between a team that counter-attacks as a ‘tactic’ versus a team that prefers to play more direct. For some reason I can not see the comments on this post. Can they be exposed? Scott, there are no other comments – the other comments referenced are ‘pingbacks’ from other articles to this one.